I was at Sullivan Station, trying to get to the Red Line quickly. I had already wasted a train fare coming here from Wellington, and since the bus schedules are outside (why, MBTA? ), I would have to pay again to go back in. I needed this shortcut to work, for the sake of a dollar. Scouring the schedules, I saw that I just missed an 89 to Davis and there wouldn't be a 90 to Davis for a while. I didn't think to use the 86 to Harvard, so that left me with the 91 - there was one leaving now - on the lower busway. I scrambled down the stairs, shoving past everyone in my way. I saw that its doors were closed, but maybe it was just laying over, so I dashed over to it, took a picture, found out I had actually taken a video (curses! ), and stepped up to the doors. The driver opened them up and asked me why I was taking pictures. "Why you takin' pictures of the bus?" were his exact words. "It's for a school project," I replied, silently thanking my father for using that excuse last time a driver yelled at me for taking pictures. The driver hesitated a bit, then said okay. Or rather, "Aight." The bus was fairly crowded - I counted about 20 people. It left the Sullivan Busway, along with some other buses on different routes, headed onto Cambridge Street, which turned into Washington Street upon entering Somerville. After going under I-93 and over the Orange Line tracks, roadside attractions mostly included gas stations, auto repair places, and chain fast-food restaurants. We passed under Commuter Rail tracks, and stopped at a nice, modern bus shelter - under a massive highway. A fair amount of people got off at Union Square, where there are some small businesses. We didn't get much time to admire it, though, as the bus made an unexpected turn onto the more residential Webster Ave, and shortly after turned again onto Newton Street. After turning again onto Springfield Street, businesses came up again as we came into Inman Square. We joined up with the 83, making our way to Prospect Street and a more residential neighborhood. 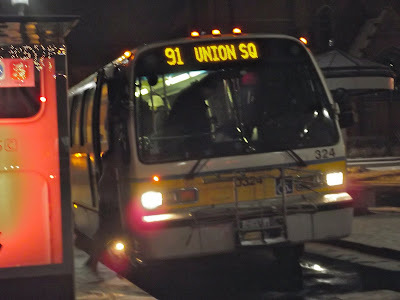 Having ridden the 83 so many times, I knew we were close to Central Square when we went by a fairly large parking lot. We then made a loop around a large church and pulled into "the Central Square busway that the 83 and 91 use." I got out, took a picture (Ha! Ha! ), and headed down to the subway. For the first time, we ride an old RTS bus! Ridership: By the end, about 30 people had ridden - not bad for a non-key bus route. Union Square and Inman Square were major stops, but many of the passengers rode from beginning to end. This is relatively uncommon for an MBTA bus, but it's nice not sticking out as the only passenger riding from beginning to end. Pros: A great link between the Orange and Red Lines. The trip was scheduled to be done in 18 minutes, and we did it in fifteen. On weekdays, it runs every 25 minutes which is decent for a non-key bus route. On Saturdays, it runs even more frequently, every 20 minutes. Cons: Unfortunately, nights and Sundays it only runs every hour.or so. It doesn't really have any unique portions except for the twisty residential bit, but it does its job as a crosstown connector just fine. Nearby and Noteworthy: Much of the route is either residential or just kind of dingy. Union and Inman Squares are sort of oases in terms of interesting stuff to do, and although it's not the cleanest or most friendly neighborhood in town, Central Square has some nice stores as well. This is a fantastic shortcut between the Orange and Red Lines. The best part: it was actually early! I had some minor quibbles about the schedule - I feel they could at least push for every half hour or so on Sundays and nights - but overall, really great bus route! Yeah, this is like, my fifth post today. No news has developed.